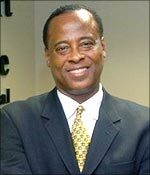 Michael Jackson's personal physician, Dr Conrad Murray, who allegedly administered a powerful anesthetic to the singer just before his death, will be charged with manslaughter and arrested within two weeks. The investigators have decided first to carry out a further search warrant, probably on a Los Angeles pharmacy, in an attempt to gather more evidence against Dr Murray, Fox News reported, quoting law enforcement sources. as they feared a jury would not convict if there was no motive, said the report. Murray is believed to have given Jackson, propofol, a powerful anesthetic drug used in hospitals before surgery. The investigators believe that the drug was a contributory factor in Jackson's death. The doctor might be given the choice by the Los Angeles District Attorney's office of surrendering either in Houston, where he is currently staying, or in Los Angeles, where any trial would take place. Murray's lawyer has said he never prescribed or administered any drug that 'should have killed' Jackson, but he never specified whether he ever gave the singer propofol.